Mardi Gras or Fat Tuesday is the last day before the start of Lent, and signifies the final day on which rich fatty foods can be eaten before the fasting and religious practices of the Lenten period. In the UK, Shrove Tuesday is also known as Pancake Tuesday, because this traditional food was a useful way of using up all eggs, butter and sugar in households, prior to Lent. This tradition is also common in Spanish America, where the period leading up to Lent is regarded as Carnival season, characterised by parades, dancing, music, costumes and masks. These celebrations are major events in the US especially in New Orleans. The exact time period and type of activities vary depending on the region. Some cities treat the whole of the period from Twelfth Night and Fat Tuesday as the carnival season. Others just regard the few days prior to Ash Wednesday as Mardi Gras. In Mobile, Alabama, the season starts way before Christmas, through Thanksgiving, New Year's Eve and leading right up to Lent. 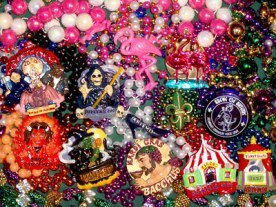 However, like most holiday celebrations, Mardi Gras has been commercialized and now it almost seems more like a celebration organized by a range of commercial parties than a religious festival. El período de tiempo exacto y el tipo de actividades varían de zona a zona. Algunas ciudades consideran el período entero desde la duodécima noche y Martes de grasa como la temporada de carnaval. Otros sólo ven los pocos días antes del Miércoles de Ceniza como Mardi Gras. En Mobile, Alabama, la temporada comienza mucho antes de la Navidad, a través del día de Acción de Gracias y la Nochevieja hasta la Cuaresma. Sin embargo, como la mayoría de las fiestas, se ha comercializado Martes de grasa y ahora parece más como una fiesta organizada por empresas comerciales que una fiesta religiosa . Why do we celebrate Mardi Gras and how did it start? 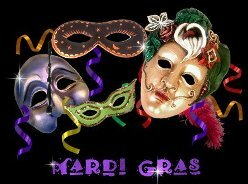 Not surprisingly the history of Mardi Gras goes way back in history and there are records of an ancient festival in February in second century Roman times. It was called Lupercalia based on homage to the Roman god, Lupercus, connected with pastoral care. The fiestas connected with these traditions were absorbed by the early Christian church and were deemed a useful excuse to allow the common people to enjoy a period of merriment before the Lenten period. Parties and masks seemed to all be part of a general abandon of normal behaviour excused by giving honour to the god Bacchus and others. There were most likely links to even earlier Pagan festivities which were in existence well before Christ. ¿Por qué celebramos Mardi Gras y cómo empezó la fiesta? No es sorprendente que la historia del carnaval se remonte en la historia y hay archivos que hablan de una fiesta ancestral en febrero en el segundo siglo de los tiempos romanos. Fue llamado Lupercalia basado en homenaje al dios romano Lupercus, relacionado con la atención pastoral. Las fiestas relacionadas con estas tradiciones fueron absorbidas por la iglesia cristiana primitiva y se consideraron una excusa útil para permitir a la gente común de disfrutar de un período de alegría antes del período de Cuaresma. Fiestas y máscaras parecían ser parte de un abandono general de comportamiento normal excusado por dar honor al dios Baco y otros. Es probable que hubo también enlaces con festividades paganas aún más tempranas que existían mucho antes de Cristo. The tradition of Mardi Gras was evident in medieval France, when the peasants would dress up in crazy costumes and create havoc in the area with a general 'free for all'. This was supposedly to allow a period of enjoyment and excess prior to the abstinence and solemnity of the subsequent Lenten period. The lords of the manor would also join in the festivals by enlisting new knights to help with donating of luxuries to the peasants. The giving out of cakes was thought to be the origin of King Cake. Also the current Mardi Grasdoubloons possibly originated with the distributing of coins and other trinkets to the peasants in those times. La tradición del carnaval se hizo evidente en la Francia medieval, cuando los campesinos se vestían con disfraces locos y crearon gran confusión en la zona con una gresca. Se dice que esto fue para permitir un período de disfrutar y exceso antes de la abstinencia y la solemnidad del período cuaresmal. Los nobles también participaron en las celebraciones con el alistamiento de nuevos caballeros para ayudar con la donación de los lujos a los campesinos. Se piensa que la entrega de pasteles es el origen del pastel del rey. Además, es posible que los doblones del carnaval actual se originara con la distribución de monedas y otras baratijas a los campesinos en aquellos tiempos. Mardi Gras in more recent eras. 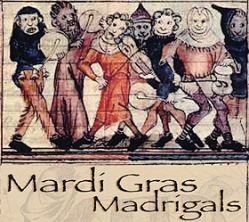 The French certainly brought Mardi Gras to the Americas. There are records of the religious festival in Louisiana back in 1699 near the Mississippi. Also in the mid seventeen hundreds there are accounts of street festivities in New Orleans. These were usually characterised by fancy costumes, masks and processions through the streets accompanied by music. Finally in the early eighteen hundreds a rich benefactor funded the establishment of the official Mardi Gras procession, which became a standing event from that time to the present. Es cierto que los franceses trajeron el carnaval a las Américas. Hay documentos que hablan de la fiesta religiosa en Luisiana en 1699 cerca del Mississippi. También a mediados del siglo XVIII hay cuentos de las fiestas en la calle en Nueva Orleans. Éstas se caracterizaban generalmente por disfraces, máscaras y procesiones por las calles acompañadas por la música. Finalmente, al principio del siglo IXX, un benefactor rico financió la creación de la procesión oficial del carnaval, que se convirtió en un evento de pie desde esa época hasta el presente. 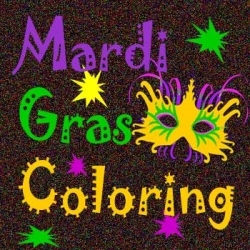 The Mardi Gras colours of green, purple and gold symbolize faith, justice and power. There is a story that it was during his visit to New Orleans in 1872 that the Russian Grand Duke Alexis Romanoff was invited to select the official colours of Mardi Gras by the Krewe of Rex. It was the Rex Parade of 1892 when this official representation of the official colours was recognised. Later the Grand Duke adopted these colours for the Russian house of Romanoff. Los colores del carnaval - verde, púrpura y dorado - simbolizan la fe, la justicia y el poder. Se dice que, durante su visita a Nueva Orleans en 1872, el gran duque ruso Alexis Romanoff fue invitado para seleccionar los colores oficiales de Mardi Gras por el Krewe of Rex. Se ha reconocido estos colores oficiales durante el desfile de Rex de 1892. Más tarde, el Gran Duque adoptó estos colores para la casa rusa de Romanov. There are many parades starting after the Epiphany but they reach maximum intensity in the four days of the Carnival weekend. Certainly two of the largest parades are the Endymion on Saturday and the Bacchus on Sunday. On Tuesday itself when all New Orleans takes a holiday, there are many school bands marching making it more of a family festival. There are many families and friends who organise the decoration of flatbed trucks for the Truck Parade. Many spectators kit out in colourful costumes and weird make-up to cheer on the marchers and walkers in the parades. New Orleans is famous for its `Krewes` or clubs for parading or mask wearing. They have their own stories of origination, some like the Jefferson City Buzzards dating back to the nineteenth century. Hay muchos desfiles después de la Epifanía, pero alcanza una máxima intensidad en los cuatro días del fin de semana de Carnaval. Sin duda, dos de los desfiles más grandes son los del Endimión el sábado y el Baco el domingo. Durante martes sí mismo, cuando toda Nueva Orleáns tiene un día de fiesta, marchan grupos de la escuela, lo que hace el festival más familiar. Hay muchas familias y amigos que organizan la decoración de camiones de plataforma para el Desfile de Camiones. Muchos espectadores se visten en trajes coloridos y maquillaje extraño para animar a los manifestantes y paseantes en los desfiles. Nueva Orleans es famosa por su "comparsas" o clubes para desfilar o llevar máscaras. Ellos tienen sus propias historias de origen, algunos, como los zopilotes Jefferson City que se remontan al siglo XIX. 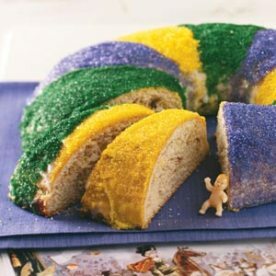 The tradition of the King Cake dates back to medieval times when the story of The Three Kings visiting the Christ child on the twelfth night grew in importance. It is an oval shaped brioche type cake made from rich Danish dough and topped with sugar in the Mardi Gras colours of green, purple and gold. The topping represents a jewelled crown in remembrance of the kingship of the Magi. Again it was French settlers around 1860 who brought the tradition to the US. In modern times, the cakes are made in all sorts of shapes, but originally they were round to represent the circuitous route the Magi took to confuse King Herod. A tiny plastic baby Jesus is placed inside the King Cake, and whoever finds the toy is entitled to host the next King Cake Party. La tradición del pastel del Rey se remonta a los tiempos medievales cuando se creció en importancia la historia de los Reyes Magos que visitaron el niño Jesús en la duodécima noche. Es una torta en forma óvalo hecha con la masa rica danesa y cubierta con azúcar en los colores de Martes de grasa - verde, púrpura y dorado. La torta representa una corona de joyas en recuerdo de la monarquía de los Reyes Magos. Otra vez, fueron los colonos franceses en 1860 que trajeron la tradición a los Estados Unidos. En tiempos modernos, se hacen los pasteles en todo tipo de formas, pero originalmente eran redondas para representar la ruta que viajaron los Magos para confundir el rey Herodes. Se coloca dentro del pastel un pequeño niño Jesús y el que encuentra el juguete tiene derecho a ofrecer la próxima fiesta del pastel del Rey. `Throw something to me, Mister` is the popular cry of paraders hoping to receive trinkets of beads, doubloons or medallions from the passing floats or balconies. Modern doubloons are lightweight aluminium in a variety of colours depending on which Krewe distributed them. The tradition of throwing things started in New Orleans in the 1870s and grew to be a really popular part of the Mardi Gras celebrations. Many of the throws become collectors` items and school children look forward to building a small collection during the period. Tirar algo a mí, señor es el grito popular de bailarines, con la esperanza de recibir abalorios de cuentas, doblones o medallones de la flota que pasa o balcones. Doblones modernas son de aluminio de peso ligero en una variedad de colores en función de la Krewe los distribuyó. La tradición de tirar las cosas se inició en Nueva Orleans en los años 1870 y creció hasta ser una parte muy popular de las celebraciones del carnaval. Muchos de los artículos de los colectores se lanza y niños en edad escolar esperamos construir una pequeña colección durante el período. The Mardi Gras balls are renown for their grandeur and prestige. An important tradition is the choosing of the King and Queen of the Krewe, which adds to the glamour of the events. They are also used as an introduction to wider society of eligible young ladies like the debutantes in other countries. There is a protocol of the `call-out` whereby women in their ball gowns wait to be invited for a dance by receiving a card from an interested young man of the Krewe. A small gift called a `favour` is presented to the lady. These are highly coveted and often very colourful collectors` items. Los Bailes de carnaval son conocidos por su grandeza y prestigio. Una tradición importante es la elección del rey y la reina de la Krewe, que se suma al glamour de los eventos. También se utilizan como una introducción a la sociedad en general de elegibles señoritas debutantes como el de otros países. Existe un protocolo de la `llamada` a que las mujeres en sus vestidos de bola de esperar a ser invitado a un baile al recibir una carta de un hombre interesado jóvenes de la Krewe. Un pequeño regalo llamado un `favor `se presenta a la dama. estos son muy codiciados y objetos de colección a menudo muy colorido. Mardi Gras music is very much influenced by the cosmopolitan mix of New Orleans including French, American and Carribbean cultures. Songs like `Iko Iko` stemmed from the affinity between the African American and Native Americans forged in the slavery period. The immensely popular `When the Saints Go Marching In` reflects the Catholic heritage of New Orleans from the French and Spanish rules. This song was originally a dirge played during funeral march which sped up and played as a celebration at the end. The much-loved Professor Longhair wrote `Go to the Mardi Gras` as a bringing together of the Mardi Gras traditions of the Zulu parade and second-lining. It is one of the best known songs of the festival. 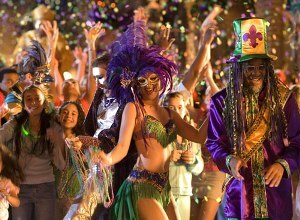 Mardi Gras música está muy influenciada por la mezcla cosmopolita de Nueva Orleans, incluyendo Americanos, Francés, y las culturas Caribe. Canciones como `Iko Iko` surgió de la afinidad entre los afroamericanos y nativos americanos forjado en la época de la esclavitud. La inmensamente popular `cuando los santos van marchando en refleja la herencia católica de Nueva Orleans a las normas francés y español. Esta canción fue originalmente un canto fúnebre jugó durante una marcha fúnebre que aceleró y jugó como una celebración al final. El Profesor Longhair muy querido escribió `ir al carnaval` como puesta en común de las tradiciones del carnaval del desfile Zulu y segundo revestimiento. Es una de las canciones más conocidas de la fiesta.